Leitmotif - a recurrent theme throughout a musical or literary composition, associated with a particular person, idea, or situation. One can't spend so much time around Laura's legacies without discovering certain mysteries that are still unraveling. I call these particular mysteries leitmotifs since they seem to be shadows of something Laura was trying to tell or show us. Unfortunately the harsh light of time, loss and death have dimmed the shadows, but they are still there for those who wish to look. Three of the more fascinating of Laura's leitmotifs are druids, witches and the reoccurring image of Pan, the horned god of the Greeks. In writing all of this I will seek to discover why Laura chose certain words and images and what authors or events may have influenced her. We no longer have the ability to ask Laura these things and so are left searching for clues in the few pieces of correspondence and books she wrote. Laura herself used words like "witch" in her last book and often connected the word to how the surrounding community viewed her. When using the word here I do so with the understanding that my definition, and perhaps hers, is that this word is a label created out of prejudice to unjustly group people whose behavior or lifestyle fell outside of the norms of the community in which they dwelled. To begin I will make a supposition, one I can't support with hard evidence, but one that I think is probable and would explain some of Laura's later writings and imagery. This supposition begins with a book written by Margaret Murray that was published in 1921. The book was entitled "The Witch-Cult in Western Europe", a book heavily influenced by a classic, then in its 3rd edition, called "The Golden Bough". Margaret's book detailed what she believed was evidence of a pre-Christian religion in Europe that had worshipped a horned God that represented the cycle of seasons, the birth, death and rebirth of the world. The worshippers of this pre-Christian religion were later disparagingly labeled as "witches" and both the religion and its followers were suppressed by the Church, finally being driven underground by the 17th century. Margaret believed that pieces of this suppressed religion could be found in the testimony from witch trials, lingering beliefs in various "little people" such as gnomes or fairies and in many "old wives tales" scattered throughout old Europe. Margaret followed up her book with another in 1931 and wrote articles for the Encyclopedia Britannica about this prehistoric religion until her death in 1963. Margaret's books were extremely popular through the 1940's here in the United States. Her claims of a prehistoric religion with female priests echoed with those espousing freedom for women, open sexuality and opposition to the oppression of the Church. All of this makes it very likely during Laura's education at the University of Iowa, (1925 - 1946), that she was exposed to Margaret's work. (expanding) There is not a story in the whole wide world that I can not believe. But you do not mean it. Then you would have to believe in Arcadia. (with a mimicry of youth in his eyes) I believe in Arcadia. Arcadia is on this mountain, Arcadia to us. No. Not In that Arcadia. I hardly know. But there come some times in my life when my heart like a dryad flies to its lair and my wild soul takes flight toward something which is far from this earth but which has always hovered there and which in truth is what I am. Is it true? Then you believe in Pan, the fauns, and the dryads? And tonight we are in our lair? I have not told you everything. I have memory of a place and of a magical time in which the moon was very much brighter than here and the sky was bluer and nearer the ground. The trees were alive and used to talk and the wind made me cry out for joy when it touched me. I remember, too, that the nights were ever so much softer than these, and every night there was a new wonder for me. All the land was ruled by one who thought only to make me happy. When the day was done and the hush of moonrise fell on the forest he would tell me stories that made me tingle from head to foot with rapture. I have never heard any other stories half so beautiful. And when the joy became too great he would play a weird little tune on his reed pipes that always brought sleep. At length, there came a parting and he took me to the Crossroad and told me of a charm that he had given me which I must never lose because it would keep me young and give me power to return. Act II of the play introduces the reader to the character of Pan himself where we learn of his ability to draw a circle around Arcadia, a circle of safety that no harm may pass through and Pan continues to appear many times throughout the play. Another instance of the Horned God comes from the most unlikely of places. 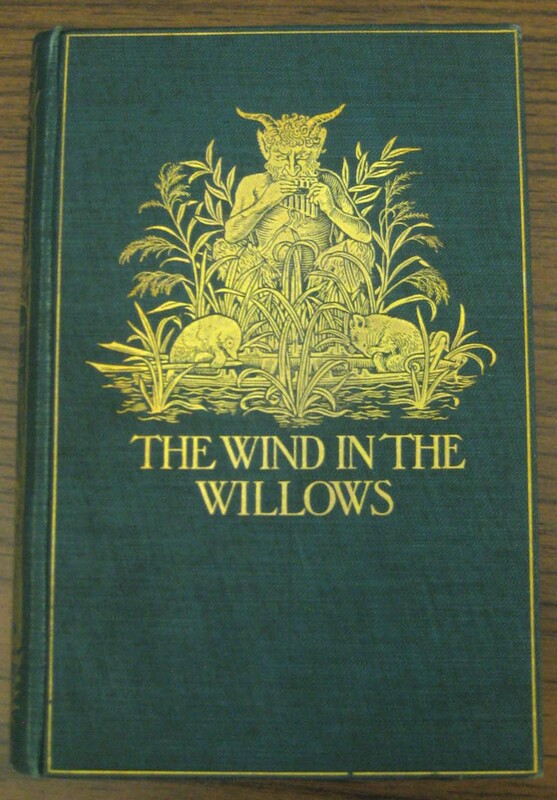 In Laura's last book called, "Lichgate on High Road", she devotes the entire last page to scene from a popular children's book titled, "The Wind in the Willows". 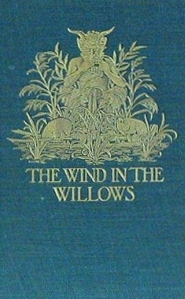 The front cover of the first edition published in 1908 is shown on the right; the Greek God Pan is embossed on the cover. This book was extremely popular in both the U.S. and England during the early part of the century and was likely one read by Laura during her childhood. 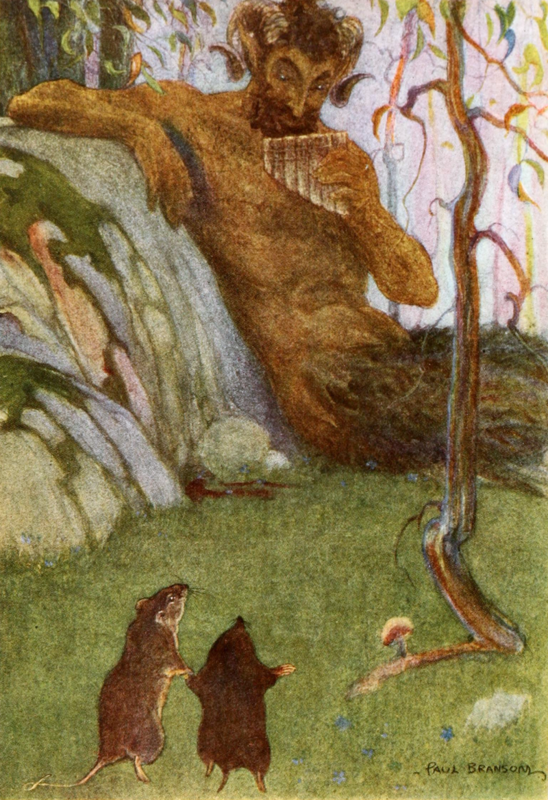 The 1913 edition contained a frontispiece as shown here on the left, an illustration drawn from the short story in the book called, "The Piper at the Gates of Dawn", (later the title of the debut album by Pink Floyd). In the story, Mole and Rat find Otter's missing son in the care of Pan who, at in the end, removes the memory of the meeting from their minds, "lest the awful remembrance should remain and grow, and overshadow mirth and pleasure." The imagery of witches weaves throughout Laura writings, sometimes very distinct, sometimes just a hint or shadow at the door’s edge, but regardless always very present. I am not sure why Laura included them as much as she did but I am often reminded of a quote by a British authoress whom Laura may have even met named Nora Lofts, (picture to the left). 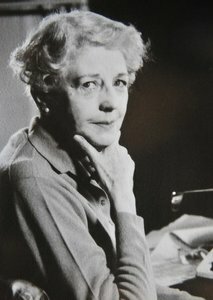 Nora wrote in her 1954 book, Bless this House, the following dialogue for her character of Lady Alice Rowhedge, “Perhaps I am the only person who, asked whether she were a witch or not, could truthfully say, "I do not know. I do know some very strange things have happened to me, or through me." As early as Chapter II of Laura’s last book, Lichgate on High Road, we hear the soft rustle of a witch when describing how visitors often imagined her home, ““It reminds me of ….” Some of the Black Forest, some of the Alps, some of Saxon England—all, of the far away, and some, of the long ago. Of the Hansel and Gretel cottage, the Anne Hathaway house, or the rooftops of Mother Goose." It would be easy to miss the witch’s shadow in this part of Laura’s book, I did for quite some time but if you know anything of Hansel and Gretel, the cottage in the story was the home of a witch determined to eat the two children. The next sentence following this description of her home’s appearances in other’s eyes is probably one my favorite from her book. “Here was a curiosity, out of time and place, a fairy tale creation, come to settle, as if by a spell, in the Florida sunshine.” As if by spell as if conjured and if so by whom? At the end of Chapter VI as Laura describes the period of construction where the cottage was wrapped in tar paper as workmen labored on the roof. Of the cottage she says, “Ominous it must have appeared, black, in the somber shade of the pine grove, for I learned years later that passersby called it the Witch’s hut.” As with the mention of the Hansel & Gretel cottage above it would be easy to just read this and not notice the subtleness present in a single letter. In the original book the word witch is capitalized. This indicates formality, possessiveness, ownership, the cottage isn’t a generic witch’s home, no, it the Witch’s home, was Laura leaving us clues as to who she was? It was during this time of the cottage’s construction that we next encounter a reference to a witch. In Chapter VIII, Laura relates visits she received during her first few months as the cottage stood, still unfinished, but livable. “In quiet moments I could recall curious visitors to the pine woods, where I lived in isolation, at least a thousand feet from my nearest neighbor. There was the man who came looking for hound dogs, one who wanted a plumber, and a third who inquired whether I did “reading.” The last sought help through divination in finding important papers conveying ownership to land.” Here again we could easily pass over the words without giving them deep thought, “reading” referring to some sort of Southern folk divination but obviously regardless of whether Laura helped or not, she took the time to find out what the person asking needed and remembered it showing it might have been more than just a passing conversation. Oddly in light of these last revelations the next two quotes tell of things done to protect the cottage from witches. In Chapter X she mentions hinges for the front and back doors by saying, “The front door swung open on H and L hinges from a forge in North Carolina and lamps from the same iron-forge lighted the way to the dwelling…” Once again a shadow passes for the H and L hinges mentioned have a peculiar history. 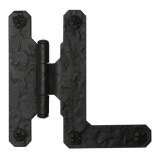 The H and L refers to a type of hinge used for hanging heavy doors, (see picture), H and L comes from their shape and is an old term for this type of hinge, old enough in fact to have folklore connected to it. This folklore claims that early settlers to the United States installed these hinges on their home and barn doors to protect themselves from witches, H and L standing for “Holy Lord” and their “cold iron” constitution considered an anathema to fairy and witch alike. No one has ever found the origin for this legend and as many dispute the folklore as support it, but like much folklore it refuses to go away. The last quote opens Chapter XIV, the closing chapter of Laura’s book, “The Druids believed a holly tree near the house could, with its magical power, ward off witches.” This association of the holly tree with protection is very old. 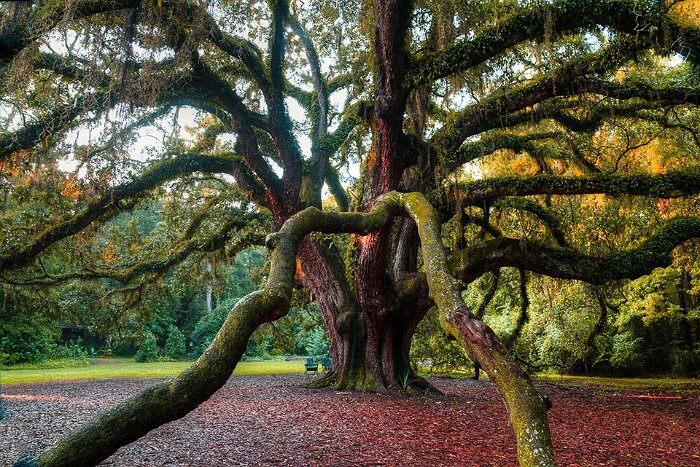 Legends ascribe the ability for the tree to ward off poisons and lightening along with the supernatural and for all these reasons Laura surrounded the cottage with holly. The silvered ball in question was called a “witches ball” and they were manufactured near Bristol, England from about 1790 until the 1870’s. Originally they were clear rounded flasks to hold holy water and were later silvered to reflect though the image reflected would be upside down. This ability to reflect “everything all wrong” was thought to give the flask extra power to protect against witches and evil. These flasks later evolved into the shiny balls we place in gardens and continue to be associated with good luck and protection. Interestingly enough, the same page of the book that mentions Mole and his observations contains some telling words just a couple of paragraphs later. While Rat is running around Mole’s home making comments about it he says the following, “”What a capital little house this!” he called out cheerily. So compact! So well-planned! Everything here and everything in its place!” I can picture Laura as a child reading all these words and storing them away for the home she would one day want for herself. So here we are all these years after her death and still puzzling over who Laura was. For everyone who knew her and that I have interviewed, she was or believed in this thing or that. For me it is still all a grand puzzle and one I enjoy spending time trying to figure out. Did Laura think of herself as a witch? In our current terminology and understanding undoubtly not. 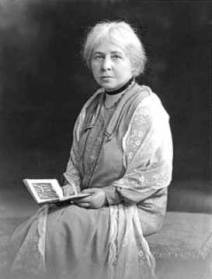 But in the understanding of Margaret Murray’s book mentioned above, then yes, she was in line with the women in the past who were midwives, herbalists, caregivers, caretakers of nature, those who saw the birth, death and rebirth of the world as something incredibly beautiful, incredibly special. Had Laura lived before the 17th century she would have been a part of that maligned group whose lifestyle and beliefs would have condemned her. Even in the 20th century she suffered enough, loneliness, misunderstanding, and discrimination.